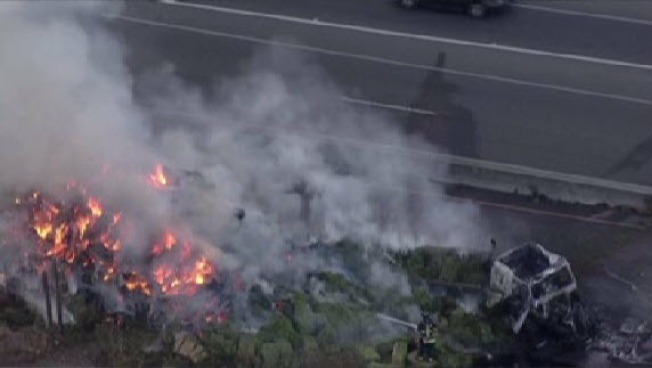 Both directions of Highway 37 were closed Friday morning at the at Mare Island Bridge in Vallejo because a big rig carrying a load of hay, crashed and sparked a fire. The California Highway Patrol issued a Sig-Alert just before 7 a.m. on westbound Highway 37 near the West Wilson Avenue offramp. The CHP advised commuters to use state Highway 29 as an alternate route from Napa. Chopper video showed bales of hay on fire. An hour earlier, a big rig carrying a load of gravel struck a center divde in Walnut Creek, snarling the commute on Interstate HIghway 680.